15 years ago fans of the "Star Trek" franchise were in a very similar situation as we are today. We were all anxiously awaiting a major cinematic event in the history of "Trek" -- the meeting of the two historic Captains of the starship Enterprise. 1994 was a wild year for "Star Trek" with the end of "The Next Generation's" TV run, the simultaneous production of "Deep Space Nine", and development of a third spin-off series: "Star Trek: Voyager". It was all capped off with the release of "Star Trek Generations" -- one of the most controversial films in the history of the franchise. For as many people who hate "Generations" there's just as many who loved it. And the box office receipts as well as the merchandising sales bonanza certainly proved that fans did come out to see it. No matter how people feel about the finished product it's certainly a film that incites some very passionate reactions from fans. Let's take a look back at the process of making and releasing one of the most anticipated "Trek" films ever made. 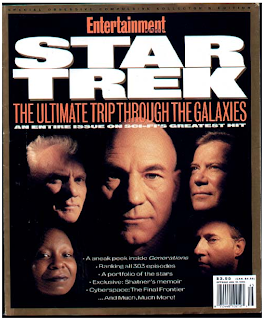 In 1992 with the popularity of "Star Trek: The Next Generation" reaching a frenzy (at one point the syndicated series had even been able to beat the World Series of Baseball in most major markets), Paramount decided that the only logical course of action was to shut down production on the series after the seventh season (when every one's contracts would be up) and begin production on feature films with the now immensely popular cast. The show was only going to get more expensive to produce, and the worldwide profits to be made from a hit film were too lucrative to ignore. Producer Rick Berman was given the task of developing a film that would serve as the "Next Generation's" maiden voyage on the silver screen. 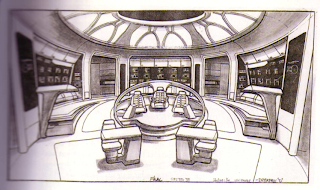 Concept art for the redesigned Enterprise-D bridge. After getting the green light from Sherry Lansing ( the head of the studio's theatrical division who had just replaced Brandon Tartikoff), Berman decided to commission two screenplays for the project. 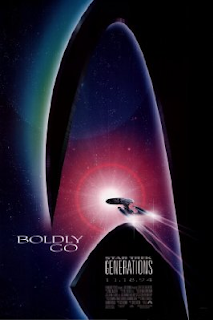 One by former "TNG" writer-producer Maurice Hurley, who had been responsible for some of the show's early successes including the introduction of the Borg in the episode "Q Who?" and another by the hot young writing team of Ronald D. Moore and Brannon Braga, who were quickly becoming the show's star writers. 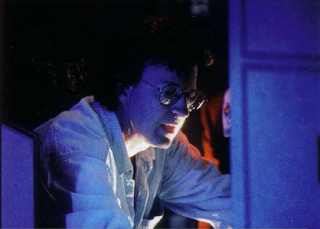 Hurley's screenplay told the tale of a fold in space, through which alien creatures accidentally fall into our dimension. These creatures soon become a threat to the universe they are desperately trying to leave. The story was in essence a tale of survival at any cost by creatures who don't realize the amount of damage their attempts to return home is causing our universe. It's up to Picard and company to stop them. Hurley's tale featured the character of Captain Kirk in a series of scenes were Picard summons a holographic manifestation of the legendary Captain on the ship's holodeck in order to seek his advice. Moore and Braga went for the more traditional approach of creating a villain who could motivate the story in their script. Their script also allowed the real Captain Kirk to be an integral part of the tale and not just a holographic manifestation of the character. 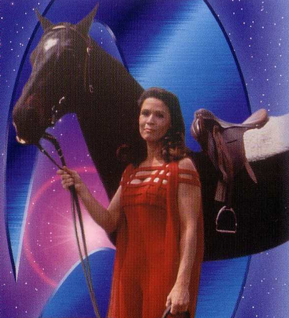 Their concept of a nexus which could transcend time and space soon won over the Paramount executives who agreed the Moore / Braga concept would make for a more dramatic film. 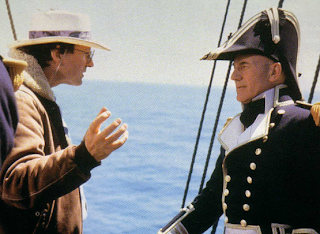 The same Paramount executives had initially told Berman to set out to make a "Next Generation" film and not worry about including any members of the original cast, but both Berman and Patrick Stewart felt they would be missing out on an opportunity to create something even more dramatic if this film wasn't treated as a transitional story from one Generation to the next. Early on during story meetings for their script Ron Moore and Brannon Braga -- looking for something powerful and dramatic to anchor the film with -- pitched the idea of killing off Captain Kirk to Berman. 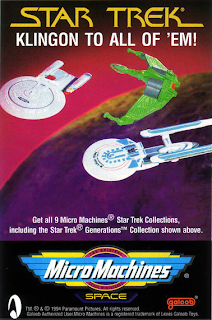 The group went on to meet with the studio heads who assured them that if they were truly sure about doing this then they should go ahead and contact William Shatner in order to tell him about their idea. Thinking Shatner would shoot them down Moore, Braga, and Berman became pleasantly surprised when the actor informed them that as long as the event was important to the story he had no objections to killing off his character. The writers set off to complete their first draft of the script featuring the entire cast of the original series in the first act of the film and closing things off with the death of the legendary Captain. Producer Rick Berman and Production Designer Herman Zimmerman. Once the Paramount executives read the Moore / Braga script they told Berman to contact Leonard Nimoy and try to get him involved. On October of 1993 Nimoy was sent a copy of the script with an offer to direct and portray the character of Spock one more time. After reading the script, Nimoy had a series of issues with the story. He proceeded to bring them up at a meeting with Berman. He said he was not opposed to the idea of taking part in the film, but in order to do so his concerns would have to be addressed. By this time Paramount had set a goal to release the film in the fall of the following year and in order to make that happen they needed to go into pre-production in a matter of weeks in order to meet their late March '94 start date. Berman informed Nimoy that there simply wasn't enough time to make the kinds of revisions to the story he had in mind. Nimoy politely turned down the offer to direct. He also told Berman how he felt the character of Spock was not integral to the story and that they could take the couple of lines he had and give them to other characters without it making a difference, so because of that he decided to pass on the offer to appear in the film. After Nimoy turned down the film DeForest Kelley also decided to pass on the project feeling that his character had had an adequate send off in Star Trek 6. I.L.M. 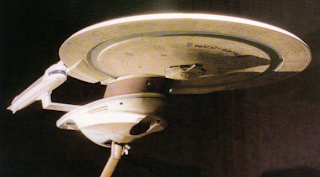 's miniature for the Enterprise-B. I.L.M. 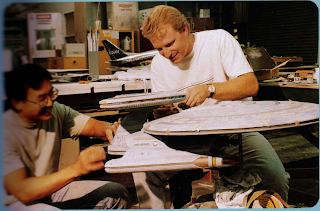 model makers at work on the Farragut miniature. After both actors turned down the film, Paramount contacted James Dohan and Walter Koenig. Both agreed to reprise their roles in the film, although it took Dohan a second offer before accepting to put on the Starfleet uniform one more time. George Takei objected to what he felt was a "walk on" role so on the next draft of the script his character's lines went to a newly created character; his daughter Demora Sulu. Nichelle Nichols was never even made an offer to appear in the film. The opening scenes of the film were re-written to only include Kirk, Scotty, and Chekov. Gone were also various scenes in which we got to see the original crew pilot the newly christened Enterprise-B out of spacedock while the new crew watched. The crew would even make the new ship do a barrel roll as it cleared spacedock, something writer Ron Moore had been wanting to see a Starfleet vessel do for years as a long time "Trek" fan. I.L.M. 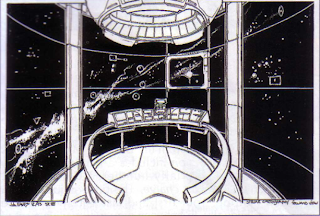 's computer rendered concept art for the Enteprise-B in spacedock. Shatner also requested multiple changes to the script in order to make sure his character was truly integral to the story and also to make sure the audience could understand why he would desire to stay in the nexus instead of immediately leaving to help Captain Picard. 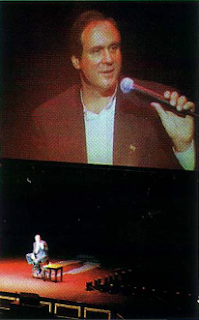 Shatner felt the audience should truly get a sense of what had been going through Kirk's mind during the days leading to his entrance into the nexus. Lynn Salvatori as "Antonia" - the woman Kirk never got to marry. Script changes were made to accommodate Shatner's notes and present a side to Captain Kirk which audiences had never gotten a chance to see. This time Kirk was introduced as a restless, confused man who without the comfort of loved ones or a family to go to has begun to wonder what his purpose is now that starfleet has no major need for him anymore. The character of Antonia was also added to the script, as the woman Kirk had always wanted to marry but never quite got around to. 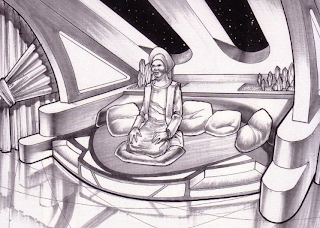 Concept art for Guinan's quarters. With an approaching start date and no director signed on Berman felt the best course of action was to go with someone who knew "Star Trek" and who was particularly familiar with "The Next Generation". 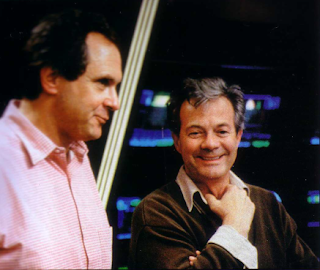 He turned to David Carson who had successfully directed the 12 million dollar 2 hour premiere for "Star Trek: Deep Space Nine" the previous year, as well as many episodes of "The Next Generation" including the fan favorite "Yesterday's Enterprise". 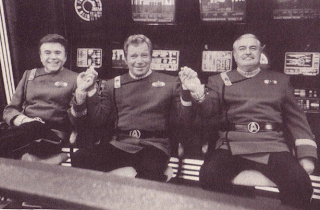 Around the first days of March 1994 William Shatner reported to Paramount Studios for the first read through of his scenes with James Doohan and Walter Koenig. 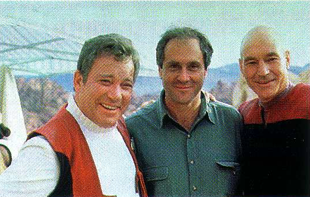 Both actors had expressed their dislike for Shatner over the years due to their feeling that the leading man had always taken the spotlight and stolen too many scenes from his supporting actors during the course of the original series and the films. I.L.M. concept art for The Lakul. It was with trepidation that Shatner arrived on the studio lot not knowing what to expect when meeting up with the two actors again after more than 3 years away from each other. To Shatner's surprise the session went smoothly and in 3 more weeks he would return to the lot to begin principal photography on the film that would once and for all bring an end to Captain Kirk's adventures across the galaxy. 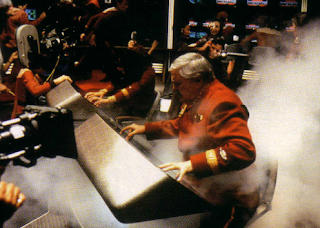 With a $30 million budget and a crew of hundreds of artists and technicians, cameras rolled on Star Trek Generations on March 24th 1994, under the direction of David Carson -- making his feature film directing debut, with the help of legendary Academy Award nominated Director of Photography John Alonzo ("Chinatown", "Lady Sings the Blues", "Steel Magnolias"). Longtime "Trek" production designer Herman Zimmerman. 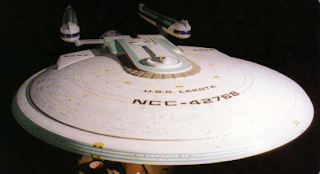 Production designer and "Trek" veteran Herman Zimmerman returned to the franchise as well as the FX wizards at I.L.M. as the lead providers of visual effects for the film with a crew headed by effects supervisor John Knoll, who would later go on to make a name for himself as FX supervisor on the new "Star Wars" prequel films. I.L.M. 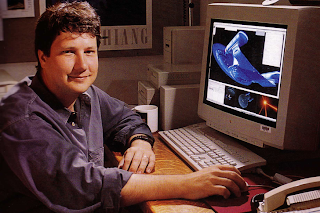 visual effects supervisor John Knoll. Alonzo's approach to the film's cinematography was one that according to him would make fans realize all that they'd been missing from watching the Enterprise-D sets on TV instead than on the big screen. Zimmerman went on to make some additions and adjustments to the sets, including changing up the color scheme on the bridge as well as adding more control stations, but it was mostly Alonzo's dramatic high key lighting and his anamorphic photography that gave the sets an epic feel with greater depth and a richer texture than what audiences had been able to see on the show. 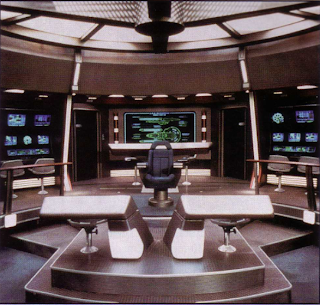 Production begins on the Enterprise-B bridge. Production began with all the scenes featuring the original crew members in order to give the "Next Generation" cast a week off before reporting to the film set since they had just wrapped production on the series finale "All Good Things...". 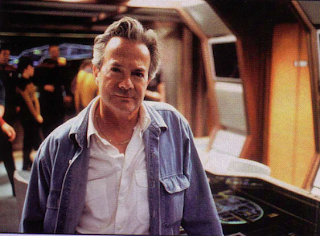 Director David Carson at work on the Enterprise-D bridge. This time around Carson had up to 4 cameras covering the action at times, a luxury compared to the simple staging and coverage the television medium forces on directors due to the quick pace of production on one hour dramas, which usually need to shoot up to 8 pages a day. On the feature the extended schedule allows for a shooting range of two pages a day. 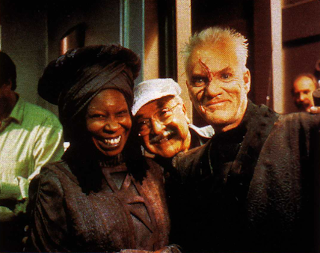 Joining the "TNG" and "TOS" cast members where Malcolm Mcdowell as the film's heavy; Dr. Tolian Soran, as well as Whoopi Goldberg who agreed to reprise her role of Guinan in an uncredited appearance in order for the production to be able to utilize her without having to pay her regular feature film rate. 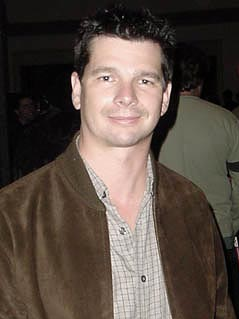 Along with the multiple improvements to the show's standing sets production designer Herman Zimmerman got the opportunity to utilize multiple locations to convey the larger scope of the film's storyline. The crew shoots on location in Santa Monica, CA. Production moved away from the confines of the soundstages at Paramount for two weeks of location shooting. The crew got to shoot scenes in Big Bear, California, as well as The Valley of Fire -- located 50 miles east of Las Vegas, Nevada, and on a 19th century sailing ship off the coast of Santa Monica, California. 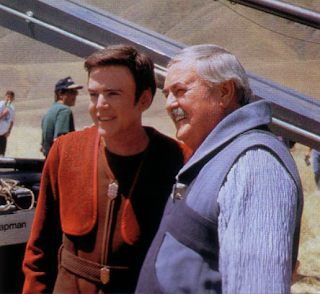 Walter Koenig ("Chekov") and Jimmy Dohan ("Scotty") while shooting the orbital skydiving scene. The film's dramatic finale was shot on top of a 500 foot peak in the Valley of Fire under extremely uncomfortable circumstances. Concept art for the new Stellar Cartography set. Concept model for the new Stellar Cartography set. 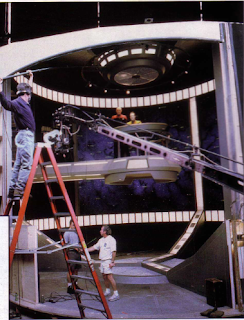 Zimmerman also got to design and build one of the most impressive sets ever seen on any of the "Trek" shows or features. The stellar cartography set is a three stories tall structure where Captain Picard and Data get to figure out the trajectory of the mysterious ribbon of energy which Dr. Soran has been attempting to intercept by blowing up stars on its path and artificially changing its course. Shooting in the multi level Stellar Cartography set. 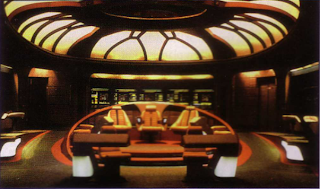 The set ended up becoming one of the most exciting visual elements in the film along with what is probably the best action sequence ever put together on any version of "Star Trek"; the evacuation of the Enteprise-D's crew onto the saucer section moments before the destruction of the ship's engineering section and the subsequent crash landing of the saucer on the surface of Veridian. 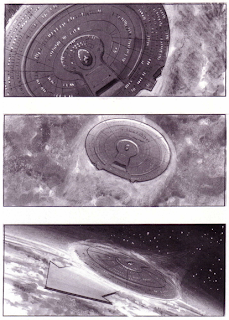 Storyboards for the Enteprise saucer crash sequence. I.L.M. contributed heavily to both sequences allowing the filmmakers to realize their vision for these two breathtaking sequences. 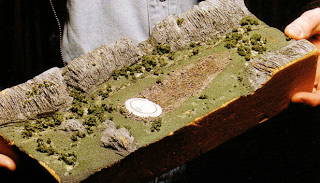 An entire miniature unit built the surface of the planet as well as a miniature of the Enterprise-D's saucer section in order to complete the sequence by shooting the crash of the saucer onto the planet's surface. I.L.M. concept render for the explosion of the Enterprise-D engineering section. I.L.M. 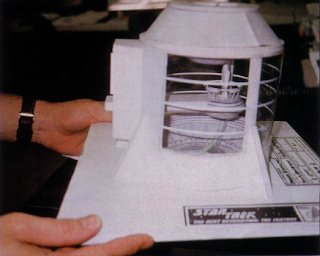 concept model for the Enterprise-D saucer crash. Prior to the start of production director David Carson and Brent Spiner (Lt. Commander Data) expressed concerns over the use Data in the script. 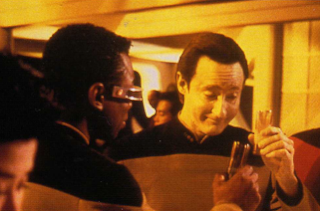 Once Data would get the emotion chip his only purpose in the script was to serve as the film's comic relief as the android discovers humor, love, and lust among other emotions. Brent Spiner as Lt. Commander Data. The script even went as far as giving Data a sexual encounter with the Duras sisters after which he proceeds to inform the crew that he's begun negotiations with the Klingon sisters just as his arm falls off from the physical strain of his sexual experience with the Klingon women. Based on the director and the actor's notes the script made a series of changes which allowed the character to get an opportunity to experience the human condition through bouts of confusion, anger, fear, and even guilt. 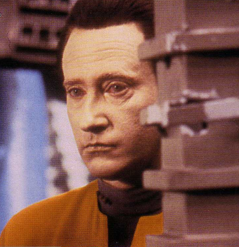 Along with the reward that comes from the gift of emotion, Data discovers that there are also consequences. These revisions to the script put Data in a similar situation as Captain Picard, who is also having a tough time dealing with the emotions triggered by the loss of his brother and nephew on a fire back in the family vineyards on earth. The scene in stellar cartography where both attempt to work on figuring out Soran's plan became a vital piece to presenting the parallels between the two character's arcs in the film. Soran and Kirk duke it out during the film's finale. The film's finale became a highly publicized fiasco as word spread to the press and fan community about the death of Captain Kirk months before the film's release. Also an early version of the script was leaked and soon it made its way to the dealers tables at multiple "Star Trek" conventions. Early on David Carson had voiced his concerns about the film's ending to the writers and producer. He felt having Kirk get shot in the back was not the adequate end for such a legendary hero. He was told by Berman to move forward with shooting the ending as scripted due to the budget constraints and the fast approaching November release date for the film. After principal photography wrapped Carson, even more upset with the ending after reviewing it in the film's edit bay brought up the subject to Berman once again. At this point Berman, who had also reviewed the footage decided to mention the situation to Paramount Chairman Sherry Lansing. He also requested money for an additional two days of filming in order to fix the problems with the scene. Lansing was soon shown the rough cut and she agreed, but she also expressed her desires to see the results of a test screening before moving forward with any re-shoots. 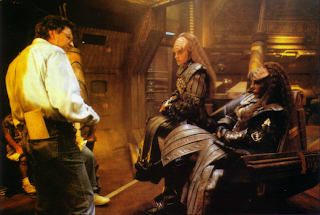 Director David Carson on the Klingon Bird of Prey set. The resulting test screening became a highly publicized affair. The test audience loved seeing the Klingon sisters back, as well as Whoopi Goldberg as "Guinan", and especially the crash of the Enterprise's saucer section. They laughed at Data's antics, but never really at him, just as Carson and Spiner had hoped when they requested the rewrite for his scenes. 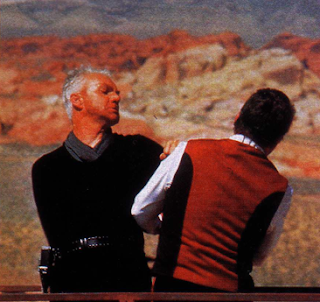 According to those present it was a great test screening until the last reel of the film rolled and Kirk's death was unable to top the previous sequences in the film. Lansing soon took action and requested the filmmakers to rewrite the sequence and prepare to shoot it as soon as possible since the November 16th release date was now set in stone. Surprisingly she told Berman and company not to worry about the cost since the studio had a great deal of faith in the picture and everyone wanted to make sure they could get the best product possible. Rick Berman joins the two captains in the Valley of Fire. On September 19th while in Toronto for principal photography on his USA Network "Tekwar" television series, William Shatner got a call from Rick Berman asking him how he'd feel about spending a few more days in The Valley of Fire. Soon after cast and crew members made the trek back to the Nevada dessert to shoot ten minutes of additional material that would hopefully provide a more heroic ending to Captain Kirk's human adventure. Kirk would now die taking a huge plunge while holding onto a bridge after one last heroic act in order to help Picard stop Soran. 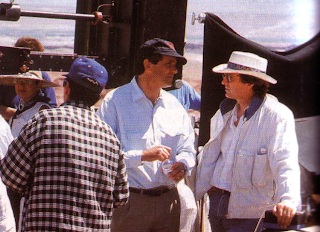 Rick Berman and David Carson at work in the Valley of Fire. The crew shot for days in the 110 degrees heat, dangerously close to a 300 foot drop. With less than 3 weeks to go before the film's opening date Carson returned to Paramount to complete the editing process and replace the original scene with the newly shot sequence. 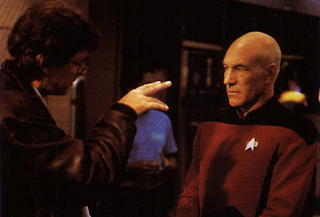 The filmmakers still needed to record the film's score provided by "TNG" veteran Dennis McCarthy, as well as mix the film and conform the negative in order to strike the 2,659 prints needed for the film's domestic release. 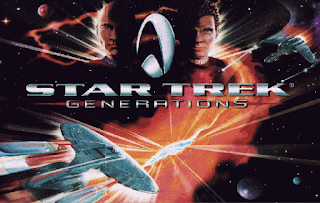 Generations benefited from a hefty marketing campaign from Paramount, which at the time was riding high on "Star Trek's" success on television with "TNG's" high ratings and the growing popularity of "Deep Space Nine". Multiple licensees who'd been producing merchandise based on the television series soon came aboard for the feature. 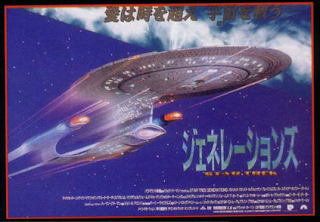 Back in the month of May the first collectible from the film was offered to fans during the television broadcast of the "Star Trek The Next Generation viewer's choice marathon". A television commercial played during the five hour broadcast offering fans a chance to order the new Starfleet communicator pins which would be making their debut in the upcoming film. 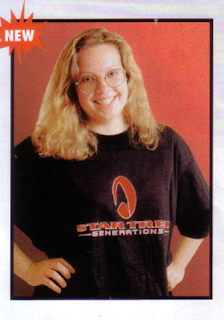 Later in the summer The Official Fan Club offered the first piece of apparel featuring the film's new logo; a black T-shirt with the newly redesigned Starfleet insignia in red. As the film's release date approached multiple items such as the comic book adaptation, action figures, role play toys, playsets, posters, and the official novelization began to show up in stores. 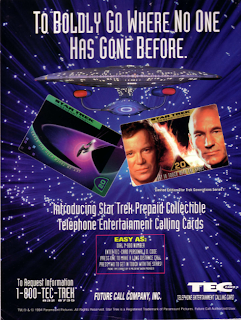 Skybox produced a set of Widevision trading cards, and Starlog press pubilshed the offiicial movie magazine. GNP / Crescendo Records released Dennis McCarthy's score to the film. 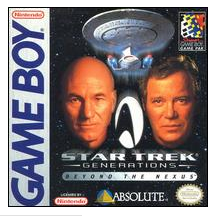 Absolute entertainment released a video game for the Nintendo Game Boy and Sega Game Gear platforms titled: "Star Trek Generations: Beyond the Nexus". 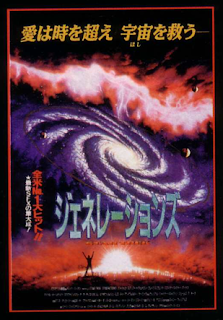 The game even featured the ability for players to punch in a code which was mentioned out during the film. Presumably this code would allow players to advance to a certain section of the game. 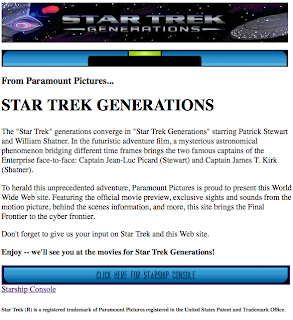 On October 1994, well over a month before the film's release Paramount launched one of the first ever web sites dedicated to promoting a feature film. Back then the web was used mostly to send e-mail, post on message boards, or visit news groups. When the site launched less than a million people in the United States had access to the internet. Fortunately, many of those people were Sci-Fi and "Star Trek" fans. After Sherry Lansing gave the project her personal greenlight a team was assembled at the Paramount Media Kitchen in Palo Alto, California to work on designing and launching the site. The site was built from print press-kit materials for the film, videotapes of the movie trailers and two dozen slides. The site became an immediate success. Pages were viewed millions of times by fans around the world. Soon after all of the major studios followed suit, building sites to promote their films. A promotion with "Jack in the Box" fast food restaurants across the west and southwest resulted in an overwhelmingly positive response. 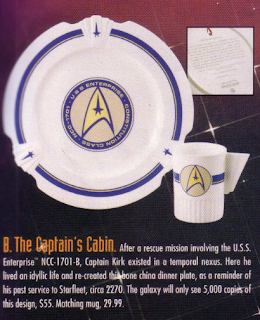 According to a press release issued by the restaurant chain just a few days after the film's opening, the Star Trek collectibles offered at the restaurants were being sought after by fans from all over the country. Calls even came in from the east coast and even Canada from people frantically seeking out the promotional items since there were no "Jack in the Box" restaurants in those areas. 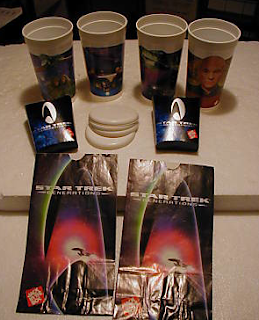 Every week of the promotion, the restaurant offered a new collector cup featuring characters and scenes from the movie with the purchase of a galaxy size combo meal as well as new milk caps and temporary tattoos with the kid's meal. 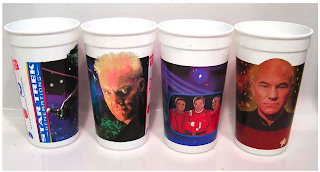 There was a series of four cups and several cards with the kid's meal items. Poster calendars celebrating the coming together of the two Star Trek generations became a hot commodity selling for only 99 cents. 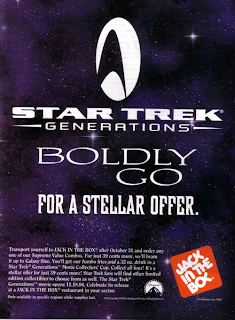 "Jack in the Box" ads designed to tie into the film appeared on the Cable Radio Network during the hour-long radio show, "Talk Trek" and in the Official Star Trek Fan Club Magazine which at the time had more than 180,000 subscribing fans. 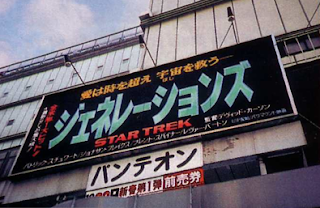 Ads even showed up on the early "Star Trek" computer bulletin boards. On the evening of November 17th the cast and crew arrived at Paramount Studios for the film's premiere, just hours before fans all across the country would get to see the film. The premiere was even televised live on E! as part of their week long "Star Treking week" celebration. The following day the film premiered nation wide to $23 million dollars at the box office in less than 3 days. An impressive sum for 1994. 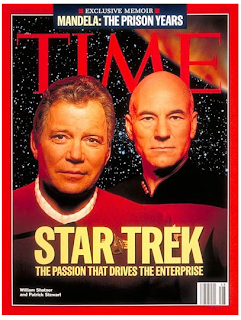 Captain Picard and Captain Kirk graced the cover of Time magazine and the new film, as well as the "Star Trek" phenomenon in general was receiving coverage all over the media. 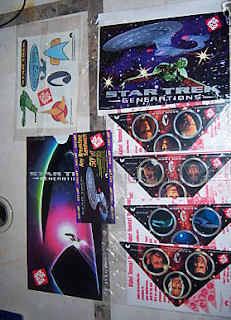 Television shopping network QVC had multiple Star Trek Collectibles specials airing all throughout the weekend with exclusive merchandise and special guests. 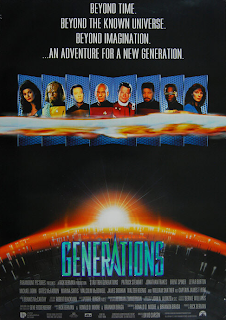 European one-sheet poster for "Generations". The cast of the film made the journey over to London's Royal Albert Hall to premiere the film in England and take part in a two day convention. Over 5,500 fans packed the venue daily. The film's cast, as well as producer Rick Berman, and director David Carson took part in the event. 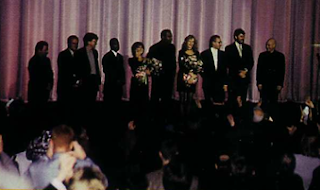 The cast takes the stage at the London Premiere for the film. Rick Berman during a Q&A session in London. 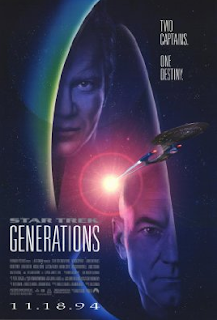 "Generations" went on to be released worldwide, becoming the film that helped jump start the "Star Trek" phenomenon in multiple international territories such as Japan -- where one of the most aggressive ad campaigns for the film was planned and executed. Japanese billboard advertising the release of "Generations". Japanese one sheet poster for "Generations". generations is good! sure seeing kirk die is something we trek fans never wanted to see.. but it was well executed. he died heroically. and the rest of the movie is problem free. the picard and kirk nexus scenes were emotional. seeing the two captains in the same scene was epic. great effects, deals with emotional themes, great score, etc. epic film! I agree with you DJTITOFLOW. "Generations" dealt with some very powerful themes such as loss, and our inability to cope with our own mortality, as well as outliving our usefulness. For a film that was put together with such a long list of demands it turned out surprisingly good. Its certainly one of the best TNG films along with the superior "First Contact". People need to start appreciating it for its heart and its attempt at dealing with some very strong themes, instead of not being able to get over the death of Kirk. He's not superman, at some point he was going to have to die anyway. Whether it happened fighting Soran in the 24th century, or a blood thirsty 23rd century Klingon - it had to happen. This character is seen as such a larger than life figure that no death scene ever put on film was going to be worthy of him in the eyes of the fans. You could have had Francis Coppola devising and executing the character's death and fans still would've despised the film. I thought the film was originally written with Kirk dying on the bridge of the Enterprise...? No? I really quite liked Generations--it honestly brings a tear to my eye to see the Enterprise D destroyed. But there are two major elements in the film which just don't sit right with me. First, the death of Picard's brother and nephew. I honestly don't buy it. Stewart's acting in response to it is superb as always, but the event itself seems forced. Is it just me, or do more people die in accidents in the 24th century than the 21st century? And while I am sure Picard himself would be devestated by this event, it's difficult as an audience member to relate to him when the characters he's mourning so passionately only appeared once, almost 4 years before this movie was released. Second is Kirk. The opening scenes taking place in the past are great, I love them a lot. But everything after that which dealt with Kirk just bothered me. I can't figure out why he has a role in this movie when I put the pieces together within the context of the story, or even within the context of thematic storytelling. He's just there to put to rest a character who fans of the original series and movies remember. I don't think anybody would deny that, really. Kirk is in this movie as, to use a colloqulism, fan service. The problem I have is that for those of us who aren't fans of Kirk's character, they don't really make a good case for adding him to the movie. Like I said, I do like this movie a great deal. It's certainly better than Insurrection, but of the four movies based off the TNG franchise, that's probably the only one it's superior to. I disagree. I'm not a fan of Kirk. Wrath of Kahn was a good movie, and I've seen the other movies involving his crew at least once, but I'm by no means a fan of the character. TNG was out by the time I was old enough to start enjoying these things, and to my sensibilities it is in every sense superior. I had no desire to acquaint myself with a crew who interested me less. Bearing that in mind, I thought Kirk's death was weak. Probably because I can imagine them using that *exact same scene* of Kirk falling, and following it with Kirk getting up and dusting himself off. Not even "need to spend some time in sickbay" dusting himself off. Obviously such a fall could kill a person in real life, but this is a franchise where people constantly cheat death by surviving far worse things than what Kirk suffered. That said, despite his death appearing to be somewhat unsatisfying, I kind of liked it. He didn't die in a blaze of glory. His personal conflict was regretting the life he led, and his victory was coming to terms with that life. He saved one more world--a feat he'd performed dozens or hundreds of times before--and his life ended with a whimper. But the whimper was one of action, not one of regrets and old age. I'm no good at brevity.